You make a compelling point about the peculiarity of fixing the founding at 1871 when there is evidence of a group by the same name (“the glee club”) the year prior. 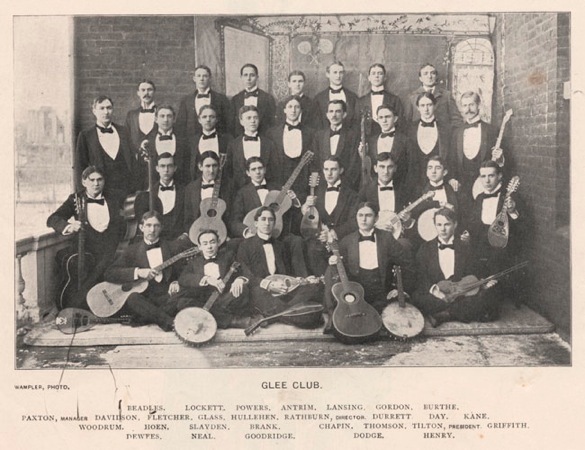 What I would wonder is when a college-wide group referring to itself as “the glee club” emerged. Ostensibly it came into being sometime between 1861 and 1886. Selfishly, I like the 1870 date, because it would allow us to hold dual reunions linking to the 1989 transformation of the Club into its current form. We could hold the 145th / 25th in calendar 2015. Inertia may make it difficult though . . . and, besides, 1871 is just a cooler number than 1870. Alice–how cool! It would be great to hear some stories about your great-uncle if you have any. He appears to have been quite the colorful character. Next Next post: Where will you be March 18-20?